MANCHESTER (CelebrityAccess MediaWire) — Bonnaroo tickets are selling like hotcakes – with help from The Police. John Mayers, president of co-producer Superfly Presents told Billboard that ticket sales were up from last year by about 20% since going on sale on Feb. 23rd. The festival , scheduled for June 14-17 in Manchester, Tenn. has a strong lineup this year, featuring headliners like The Police, Tool and Widespread Panic along with about 100 other artists. 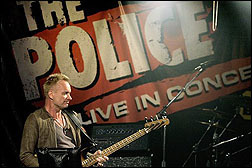 Bonnaroo will be the only festival stop for the Police, who have sold out all 16 of their shows thus far.